Both Allah SWT and Rasulullah SAW reciprocated the companions love and devotion. "… God is well-pleased with them as they are well-pleased with Him. He has prepared for them Gardens under which rivers flow (Paradise), to dwell therein forever." (Quran 9:100) Rasulullah SAW said, "The best of my nation is my generation then those who follow them and then those who follow them." 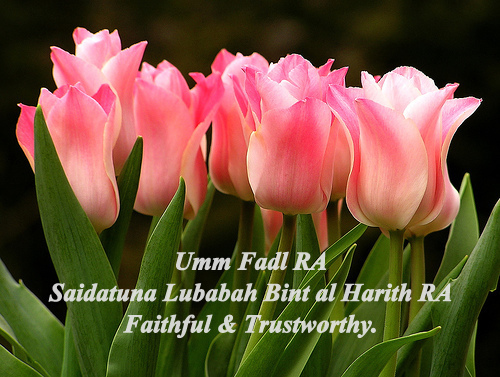 Lubabah bint al-Harith RA(Arabic: لبابة بنت الحارث‎) (c.593–655), also known as Umm Fadl, was a prominent early Muslim. Two of her sisters, Maimunah bint al-Harith RA and Zaynab bint Khuzayma RA, became wives of Rasulullah ﷺ . Her father was Al-Harith ibn Hazan ibn Jubayr ibn Al-Hazm ibn Rubiya ibn Abdullah ibn Hilal ibn Amer ibn Saasaa Al-Hilali and her mother was Hind bint Awf ibn Zuhayr ibn Al-Harith. 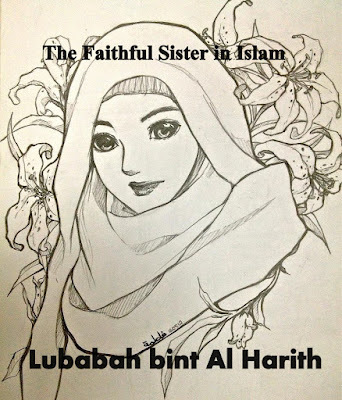 Lubabah bint al-Harith RA had two brothers and a sister from this marriage, and her father also had three daughters by another wife, while her mother had one son by a former husband. 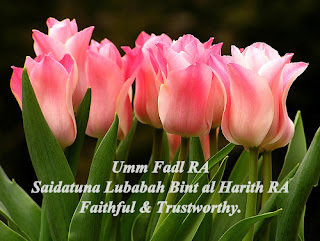 Al-Harith died while Lubabah bint al-Harith RA was still a child, and Hind then married Khuzayma ibn Al-Harith Al-Hilali. This marriage produced one daughter but was short-lived, and Hind next married Umays ibn Ma'ad Al-Khathmi, by whom she had three further children. Lubabah bint al-Harith RA married Saidina Abbas ibn Abd-al-Muttalib RA al-Hashimi, who was an uncle of Rasulullah ﷺ . Tabari states that Lubabah bint al-Harith RA was only Abbas's concubine, but this suggestion that she was a slave is at odds with her family's middle-class status. The union produced seven children: Al-Fadl, Abdullah, Ubaydullah, Quthum, Mabad, Abdur-Rahman and Umm Habib. Abbas also had five children by other women. 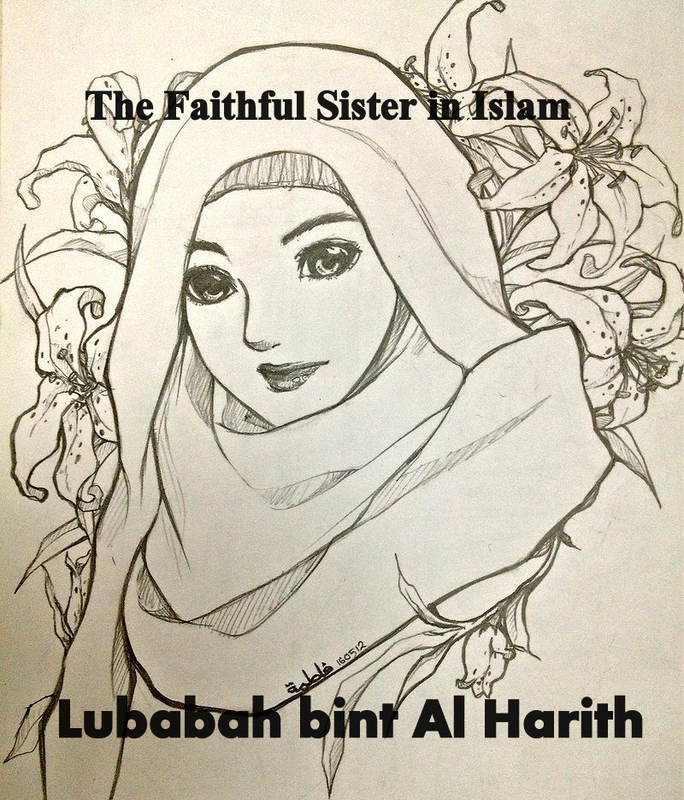 Lubabah bint al-Harith RA claimed to be the second woman to convert to Islam, the same day as her close friend Saidatuna Khadijah RA. She and her sisters were very prominent in the early Muslim community. Rasulullah ﷺ commented on their family effort: "The faithful sisters are Asma RA and Salma RA, daughters of Umays, and Lubabah bint al-Harith RA and Maymunah bint Al Harith RA, daughters of Al-Harith." It is interesting that his observation did not encompass their half-sister, Zaynab bint Khuzayma RA, who was later to become his own wife. Saidina Abbas ibn Abd-al-Muttalib RA was still a pagan in 622, so he and Lubabah bint al-Harith RA remained in Makkah when other Muslims emigrated to Madinah. Lubabah bint al-Harith RA against Abu Lahab. When the news of the Makkan defeated at the Battle of Badr arrived in Makkah in 624, there was general consternation; but Abbas's Muslim freedman, Abu Rafi RA, could not contain his joy. Abbas's brother Abu Lahab was so furious that he assaulted Abu Rafi RA, knocking him to the ground and then kneeling on top of him to continue beating him. Several able-bodied men witnessed or were in calling distance of this attack, but it was Lubabah bint al-Harith RA who grabbed a tent-pole and cracked it across Abu Lahab’s head, asking, “Do you think it’s all right to attack him because Abbas is absent?” Abu Lahab's head was split open, exposing his skull; When he died a week later, it was said to be of an infection, ulcer, or the plague. A few months later, Lubabah bint al-Harith RA was the subject of a love-song by the Jewish poet Ka'b ibn al-Ashraf. and leaving Umm Fadl in Mecca? her bottles, henna and hair-dye. when she tries to stand up and does not. the bond between us strong and unbreakable. and if she wished, she could cure my sickness. a people held in honour, true to their oath. display herself to us in the darkness of the night! 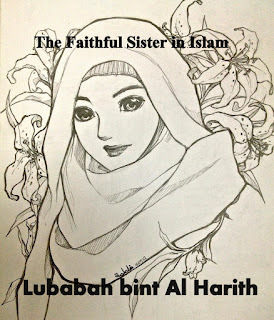 Her full name was Lubaabah bint al-Haarith al-Hilaaliyyah RA. She was the wife of 'Abbas ibn 'Abdul-Muttalib RA, Rasulullah ﷺ paternal uncle and the Mother of 'Abdullah ibn 'Abbas RA the great Companion and Commentator of the Qur’an. She was also the sister of Maimunah bint Al Harith, the mother of the faithful and the wife of Rasulullah ﷺ. According to Ibn Sa’d, she was also one of the first women to embrace Islam after Saidatuna Khadijah RA. Both Umm al-Fadhl and Maimunah RA had two other stepsisters, namely Asmaa' and Salamah who were the daughters of Umays. It was these four sisters that Rasulullah ﷺ described as, “The believing sisters!” What a praise, and what a truly great one! Umm al-Fadhl performed many duties and chores for the noble household of Rasulullah ﷺ which behind the scenes helped and contributed greatly to the call of Islam. This was because Umm al-Fadhl was a regular visitor of Saidatuna Khadijah RA (may Allah be pleased with her) and hence often also met Rasulullah ﷺ . In this way it was more easier for her to acquire knowledge of her new faith from Rasulullah ﷺ.
Ibn 'Abbas's worker witnessed mistreatment towards Rasulullah ﷺ by Abu Jahl. As his uncle, he became enraged and rushed to defend him even though he was not a Muslim at that time. Perhaps it was his love for tribalism that spurred him to act as he did. When this incident was taking place he had a quick decision to make: either to preserve his high status among the Quraysh or stand in support of his nephew and defend his blood-tie with him. Amid all this, Umm al-Fadhl was expecting the decision of Allah concerning ‘Abbas’s acceptance of Islam. She eagerly wished that her beloved would see the light soon, before it was too late. She was also hoping that he would stop indulging in people’s wealth unlawfully, for he was of those who dealt in usury. In fact, he was well known for this, just as he was well known for his love of money. Umm al-Fadhl was amazed and jubilant on the day Saidina Abbas (may Allah be pleased with him) witnessed the allegiance of 'Aqabah and played an active role in it. In fact, he also acted as a guardian for his nephew Muhammad (peace be upon him)- Rasulullah ﷺ. But when she saw her husband go out with the Quraysh in order to fight the Muslims in the battle of Badr, her pain and worry knew no bounds. "Why was he doing this? ", "Why didn't he come out openly and proclaim his faith? ", she wondered. Her worry only deepened and intensified when she saw her husband being taken as a captive after the Muslims had been helped by Allah and were victorious on that day. Yet, Rasulullah ﷺ generosity was such that he released his uncle. It was at this point in time that the light of iman (faith) began to creep into the heart of of ' ibn 'Abdul-Muttalib as the darkness of arrogance began to drift away. All praise is due to Allah alone! The Battle of Badr infact turned out to be an even greater victory because Rasulullahﷺ dear uncle accepted Islam. What a blessed household! None remained among them who disbelieved in the message of the Final Messenger, in-fact they became his ardent supporters. Umm Fadhl had always wanted ‘Abbas to acceptance Islam and now Allah Almighty had given her her hearts desire and the greatest gift for a Muslim Wife. Umm al-Fadhl was so generous that she made her home a place of refuge for the weak and poor who could not afford to migrate and join the Muslims. This was because she knew that these needy Muslims were still at war with the enemies of Allah and that even though they had been denied the opportunity of confronting the enemy physically, they were fighting a war of perseverance in Makkah against the hostile Quraysh. Among the greatest days of joy for Umm al-Fadhl and ‘Abbas was when they heard of the victory of Khaibar. This was because on that day Allah gave victory to His Messenger - Rasulullah ﷺ over the Jews and the Muslims rightfully won Khaibar's booties and treasures. But it happened to be so that Umm al-Fadhl and 'Abbas did not find out about Khaibar's conquest until later on. Hajjaaj ibn ‘Allat as-Sullami sought Rasulullahﷺ’s permission to go to Makkah and recover his money and debts which were owed to him. Rasulullah ﷺ permitted him to go and also permitted him to say whatever he needed to as a strategic method by which Hajjaaj could retrieve his wealth from the Quraysh. Hajjaaj went to Makkah and began to spread the news that the Jews had killed Rasulullah ﷺ and that the Muslims had been defeated. He also told them that Muslims had been killed in great numbers and their women had been taken as captives by the Jews and the Quraysh actually believed him! In this way he retrieved all of his wealth and debts owed to him and he headed back to Rasulullah ﷺ in Madinah. ‘Abbas ibn ‘Abdul-Muttalib, who was present in Makkah at that time, approached Hajjaaj and asked him about the reality of the situation, for he was he was very very sad and worried to hear that his beloved nephew had been killed. Hajjaaj informed him of the truth but requested him to conceal the truth for three days. ‘Abbas conceded and promised to do so. When Hajjaaj told ‘Abbas the truth he was overjoyed to hear that the Muslims had won and the Jews had actually been defeated! He returned home and informed his wife Umm al-Fadhl about the truth of the matter and requested her to keep this news confidential. Her husband 'Abbas trusted her because she was a woman of her word and a woman who was known to have the ability to keep secrets. After three days ‘Abbas came out in public wearing his best attire, emanating of perfume, which his wife had applied on him. He went out into the courtyard of the Ka’bah where the Quraysh leaders and public usually gathered. When they saw him dressed in this fashion, exuding perfume and shining with happiness, they began to mock him. They said, “Is that how one should show patience over a calamity, O Abul-Fadhl? !” They were referring to the supposed defeat the Muslims had suffered at Khaybar. Their mocking did not upset 'Abbas; he simply informed them of the truth and how Hajjaaj had fooled them all so as to retrieve his money and the debts which people owed him. The news came as a strong chilling wind towards them! They stood in utter shock and disbelief, feeling that they were now soon to be handicapped from the power and authority they once so injustly enjoyed. How true their feelings were. Umm al-Fadhl remained in Makkah with her husband ‘Abbas until after the treaty of Hudaibiyah. When Rasulullah ﷺ came to Makkah with his Companions to perform the ‘Umrah of Qadhaa’ (of expiation, because they had been previously prevented from performing 'Umrah) they stayed in Makkah for three days. He then proposed marriage to Maimunah bint Al Harith RA, Umm al-Fadhl’s sister, a widow whose husband had died as a polytheist. Before Maimunah's marriage to Rasulullah ﷺ she was living in the house of her sister Umm al-Fadhl and under the protection of ‘Abbas. After all of the pilgrims left Makkah, ‘Abbas and Umm al-Fadhl also migrated to Madinah with their entire family. In Madinah Umm al-Fadhl was a frequent visitor to the Prophet’s house. She would either come to visit her sister Maimunah or in order to visit the other wives of Rasulullahﷺ. Her character was such that all of them enjoyed her company and acknowledged her excellence. Rasulullah ﷺ then interpreted, “Fatimah (my daughter) will give birth to a boy who you will nurse with the milk of Quthm (meaning her son)." This famous Prophetic Narration shows us how Allah Almighty had blessed Rasulullah ﷺ with special knowledge. Indeed, before Fatimah had even given birth, by the will of Allah, Rasulullah ﷺ prophesied that it would be a boy. This was in fact just one of the manifestations of revelations and prophesies which Allah had endowed his trustworthy Messenger and the seal of His Prophets, blessing and peace be upon him, with.Fatimah gave birth to Husin and Umm al-Fadl nursed him along with her son Quthm. When Husin RA was only a few months old, Umm al-Fadhl brought him to his grandfather. Rasulullah ﷺ then sat him down on his lap; the boy urinated on Rasulullah ﷺ, for which Umm al-Fadhl smacked him between his shoulders. Rasulullah ﷺ rebuked her for this, “You have hurt my son! May Allah have mercy on you!” In this way Umm al-Fadhl visited the household of Rasulullah ﷺ just as a family member does. She was a woman who looked out for the Prophet’s household and played an important role in running, looking after and maintaining it. Umm al-Fadhl performed an outstanding act to dispel this rum our when she took a vessel of milk and brought it to Rasulullah ﷺ. The Prophet took it from her and drank all of it in full view of the people. The people then realized that he was not fasting and so those of the Companions who were fasting broke their fasts. There is no doubt that Umm al-Fadhl had indeed previously heard from Rasulullahﷺ that it isn't permissible for the pilgrim to fast on the day of ‘Arafah. With her intelligence and wisdom she was able to clarify the confusion surrounding this issue without having to speak unnecessarily before the men. Not only is Umm al-Fadhl (may Allah be pleased with her) remembered for her great feats but also for the fact that she was the mother of the great Companion, ‘Abdullah ibn ‘Abbas, the learned of the Ummah, the interpreter of the Quran and the scholar among the companions. May Allah be pleased with her and please her! Amin. Saidina Ali RA - The Lion of Allah. Rasulullah and Dahwah of his Uncle. Abdullah Ibn Jahsh RA - First Islam Army Commander. Abu Jandal RA - Tortured & Suffering from Quraish. Abu Sa'id Al Khudri RA - Prolific Narrator of Hadiths. Amr ibn Salamah - A Child Imam. Hakim bin Hizam RA - Born within the Kaabah. Imran Ibn Hussein RA - The Angel's Resemblance. Miqdad Ibn Al Aswad - Married to Rasulullah's cousin. Sa'id Ibn Amir Al Jumahy RA - The Poor Governor. Salman Al Farisi RA - The Truth Seeker. Suhaib Al Rumi - What A Bargain!!! Suhayl Ibn Amr RA - An Instigator To Murrabi. Thabit Ibn Qays RA - The People of Paradise. Tufail Al Amr Dausi - From darkness to light. Umar Abdul Aziz dismiss a governor. Amr Ibn Murrah Da'wah to his Peoples. Nusaibah the brave women of Islam. Umar Al Khattab RA - Wept for the love of Rasulullah SAW. Abu Ubaidah RA - Losses his teeth. The Major Narrator of Hadiths. The Slayer of Apostates and Falsehood. Sermon of Abu Bakr RA. Asim Ibn Thabit RA - Allah Response to his Duas..
Zayd Ibn Harithah RA - The Biiter Experience.